Bolts straight onto all the ’04-on EXC (with one piece rear end). It will fit older models as well, but requires the use of the twin-bolt ’03 SX seat, or the seat can be modified. 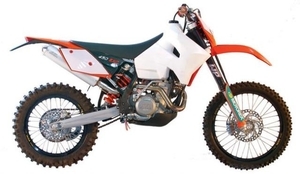 It will give the EXCs an impressive trail range, while still retaining the slim lines of the stock tank. We’ve replaced the stock radiator shrouds with tank wings, so the extra fuel is carried forward and low – this also gives the radiators impact protection in a crash.